The clearness of this day made Lansing Shoal look like she was just off Squaw, and our motion toward the outpost almost imperceptible. Occasionally we spotted a fish or two swimming under us. I asked Jerry how he and the group had come together. Although he had always been interested in history, his wife Barb had brought the passion for lighthouses. He was quickly hooked by the romance of the light, and their quest began. 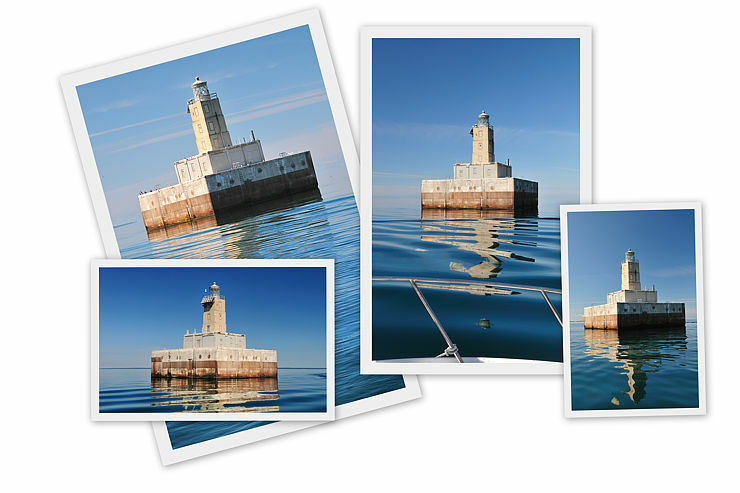 In 2005 he released The Ultimate Guide To West Michigan Lighthouses, now in its third printing. The Ultimate Guide To East Michigan Lighthouses came out in 2006, and last fall the third and final in this series, The Ultimate Guide to Upper Michigan Lighthouses, appeared. When he began he would set out on his own, but after investing tens of thousands of dollars in travel and charters for his first book, he realized that assembling a group to share the costs was a better way to go. 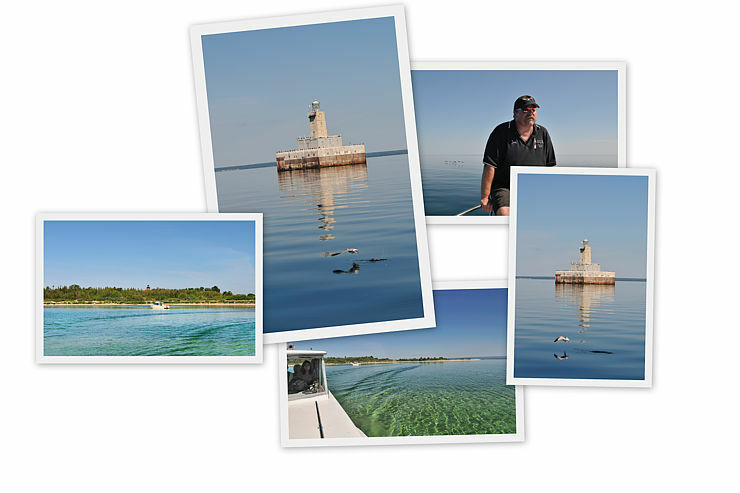 So in addition to author and photographer, he put on the hat of being a guide, helping preservation groups with their events and publicity, and arranging trips like this for others through his Lighthouse Central website. While talking with Jerry perched on the bow, we caught the glimmer of a fish jumping. Then a few minutes later a group of cormorants confidently powered by our bow with fast, strong wing strokes. Only slightly disturbed by our boat and conversation, they easily maintained their deliberate flight plan close to the water. Now Lansing Shoal was at hand and cameras were readied. With all its portholes, windows, and doors tightly paneled over, the upper structure yellowed by the sun, Lansing Shoal was guarded by a whole corps of black birds. At first they maintained their line, but as we circled the cubist construction one cadre at a time gave way to our superior force and darted off along the horizon. The rust-colored metal plates attached to protect the concrete abutments from the ice, the interrupted ladders, the pool-like top rails, and the modern bunker on top all seemed out of place in the middle of the calm lake, like surplus machines bestilled on battlefields after vegetation has grown up around them. We circled, and then doubled back and moved on to the day’s main destination – the South Fox lights. At 8½ this was a lengthy journey, which gave us time to talk as we passed High. Then the Foxes came into view while Beaver slowly became the small silhouette on the horizon.